Today we are talking about the ottoman or ottomans. The plural is not ‘ottomen’. I know that, because I looked it up. See? I am a woman of information. 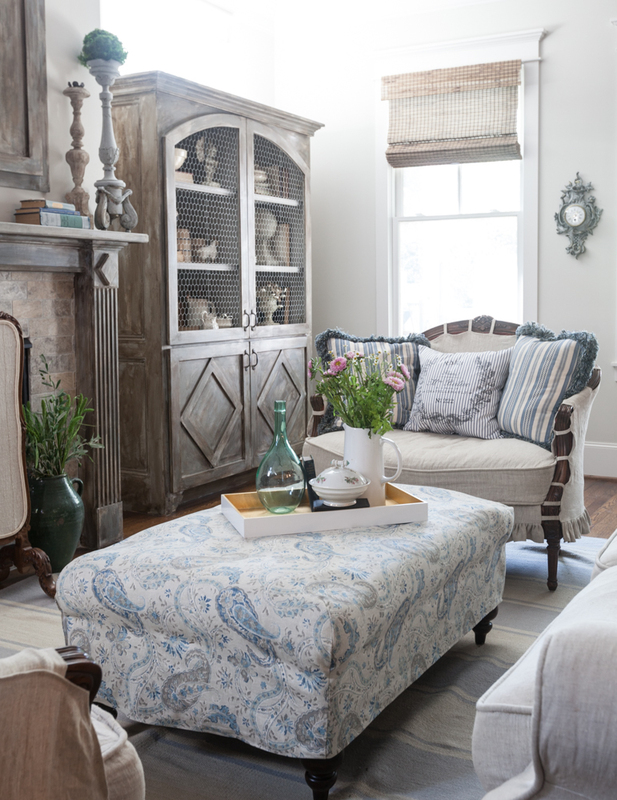 There are many ottoman styles that work so well with farmhouse French style. The first one is burlap with exposed legs. It looks a bit Gustavian with the simple white legs and casters. The next ottoman is more curvy and French looking. Okay maybe this is really a bench and not an ottoman, but I’m still including it, since it could be, sorta, maybe a ottoman. The next ottoman is round. I made a linen ruffled slipcover and this ottoman also has casters. Here’s the second cover I made for the this one. Here’s one that has no legs. It’s a wool Kilim ottoman. Although not French I love these simply designed Kilim patterns, and think they go beautifully with farmhouse French style. Below I have more simple ottomans. I bought these three at a Home Goods, and made burlap slipcovers for them. Later, I replaced them with these three in purple. Yes this is the same settee I have in the living room, but this ottoman is different. This one is not round, but was made specifically to go with the settee. With the ottoman, the chair becomes more of a chaise lounge. 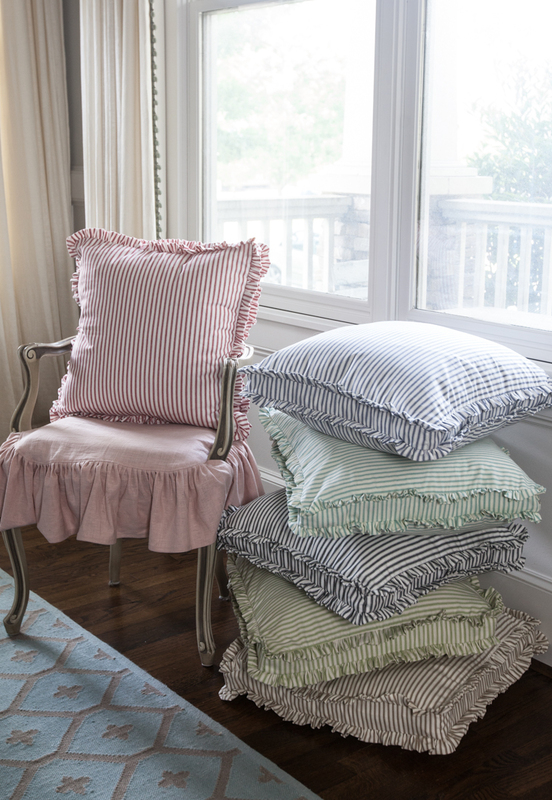 I made these linen slipcovers as well. Some people have said this was a piano bench at one time. Either way, it’s beautiful with new paint and fabric. You can see the transformation HERE. This pretty ottoman may look like it came with the chair, but it didn’t. You can see the before photos HERE. This one is very French, a Louis XV style. Then, there’s the ottoman of Peggy’s that I just made the slipcover for. 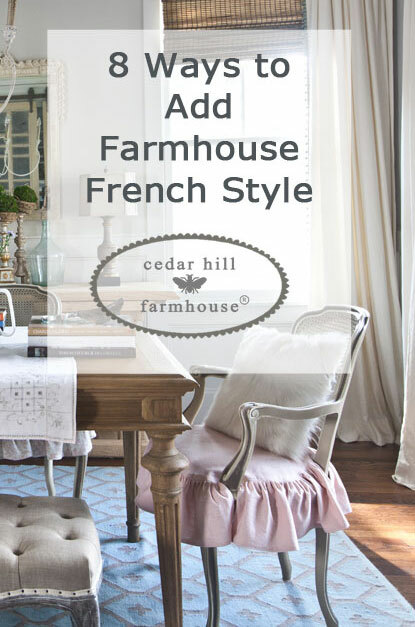 So there you have it, burlap, linen, buffalo check, and Kilim wool all work with farmhouse French style. Painted white legs, stained legs, and no legs are all fine. There are many styles that are very compatible. 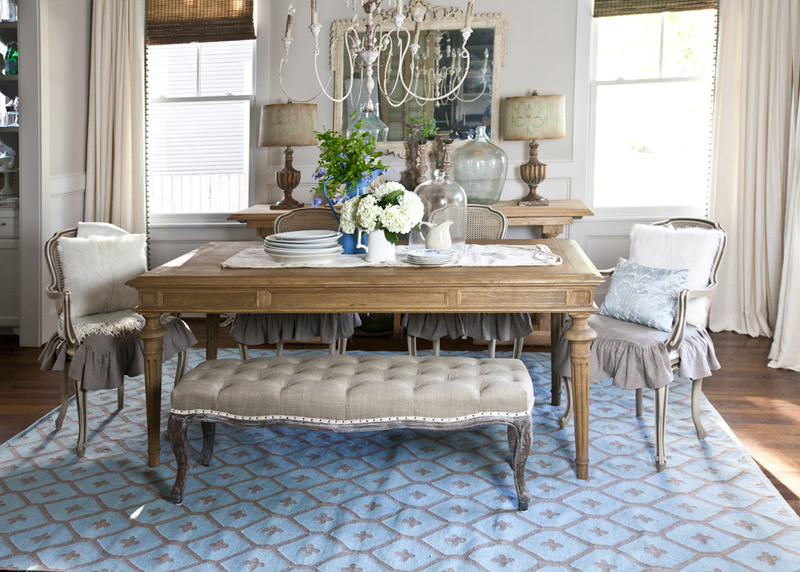 So in love with the blue and white buffalo check chairs! I love ottomans! All of these can be used for extra seating! So pretty. I can’t decide which one I love more! 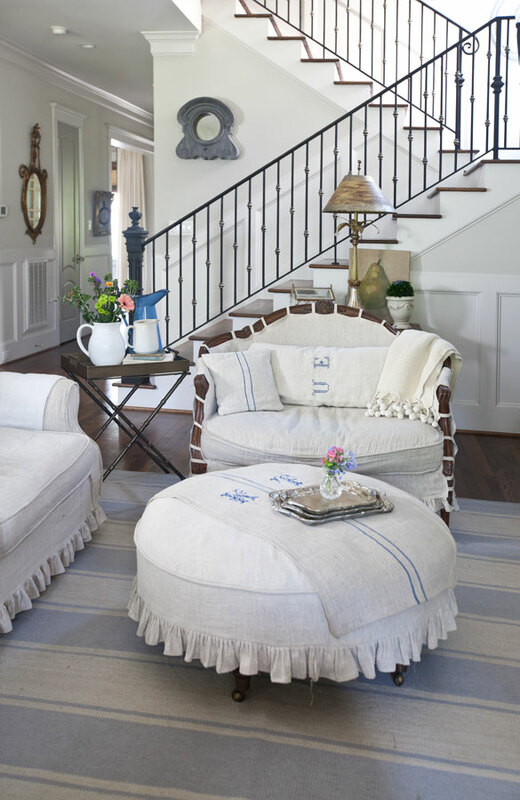 I love the round ottoman with the little pleated skirt and the buffalo check chairs! Fabulous. Love the idea of using an Ottoman as a coffee table! 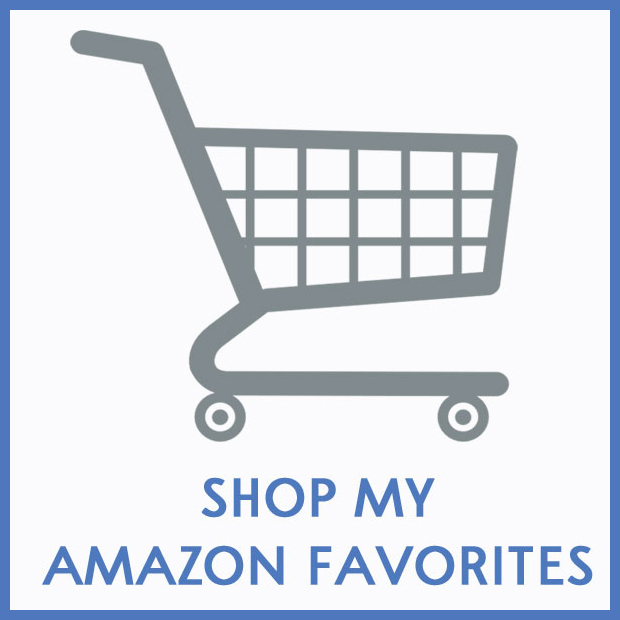 Anita – I love all of your slip covers you’ve made! Allot of work but worth!! I have a couple of ottomans and really like them. Hi Anita, I just love everything you do. I could move right in and feel at home! Would you mind telling me where you got your sea grass/sisal rug? I am looking for one, however, I want it to be synthetic, not the natural material. Thanks for all the inspiration you give me. I love love love ottomans! All sizes and shapes. Love the fabric and style on all of your ? All are gorgeous, but your slipcovers are amazing!!! I’m on slipcover try number 3, someday I’ll learn, lol!!! Love everything you do! You are my inspiration. Love every single one of these ottomans! Love tufted ottomans, square and round, wonderful inspirations? I could not pick a favorite. You have inspired me to slip cover my large ottoman. On the fence in my house about bringing an ottoman back. 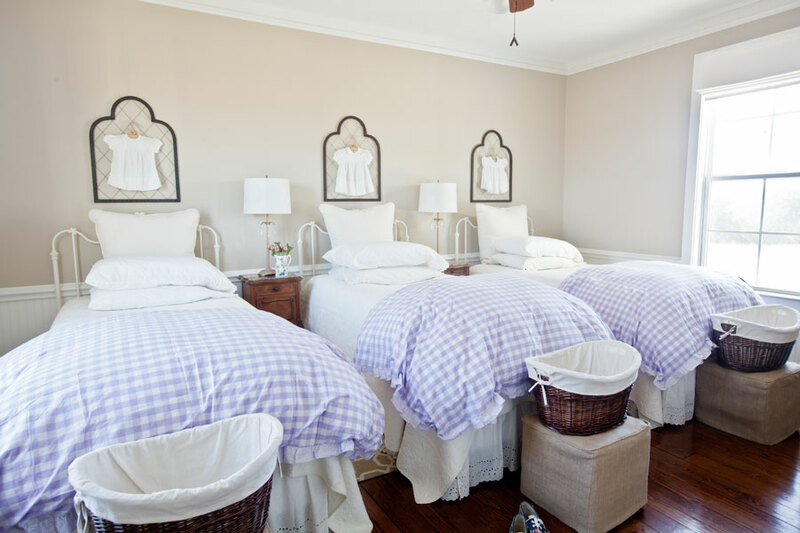 However, I am in love with the idea of three beds in a bedroom. We have an upcoming wedding next year and I’ve been dreaming about doing this for guests. what a fun post…love it all and can’t pick a favorite. I have a bench like the one you say people called a piano bench but mine goes with a dressing table. No matter what their name is …every one you have here is AMAZING and so pretty. I love to see before and afters. I especially love the way you refurbished Camille!! Love all these ottomans! Beautiful! I love all the ottomans. I especially love the rug pictured in the first one.. Have a great weekend. The ottomans are all lovely. I especially like the lined ones that you sewed the slipcovers for. I need some of these in my life! i Just love your pillows. I would love to make some with scripture verses. Do you know how I can do this? I’m not sure. You might check with the Graphics Fairy. She has some transfer techniques for graphics. I love them all! And just adore your dining room. I love French-styled furniture. 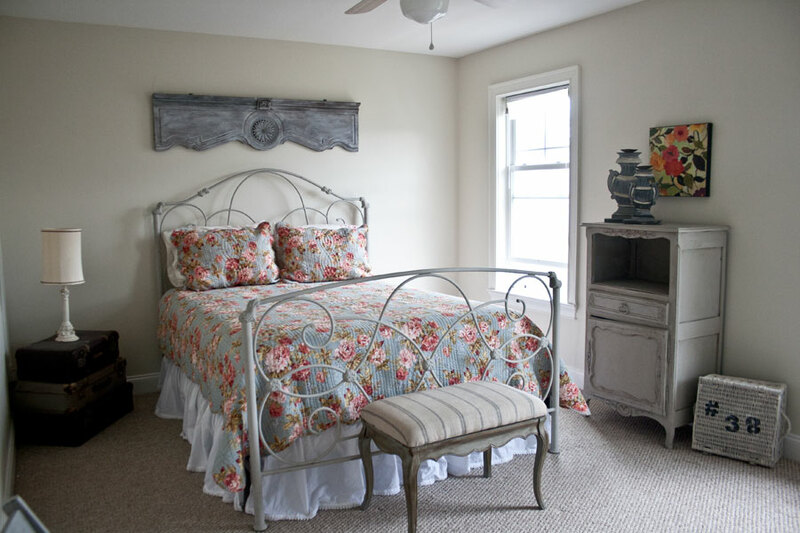 With incorporating farmhouse style you have created some fabulous rooms. So nice to see the different styles and covers of ottomans – and inspiring! Thanks! Here is a simple DIY project. Take a low side table or coffee table (everyone, especially men, put their feet on them anyway) and trim the legs down to make the piece 16″ high. Add 2″ of foam covered in batting then slip cover or cover just the pad with fabric of your choice. Voila! You have an ottoman or bench. In my opinion, coffee tables are a waste of space. An ottoman or bench is much more functional because it provides extra seating. If you need to use it as a “table”, just add a tray. Most people in Europe have much less space in their homes than we have. Therefore, multi-functional furniture is de rigueur. 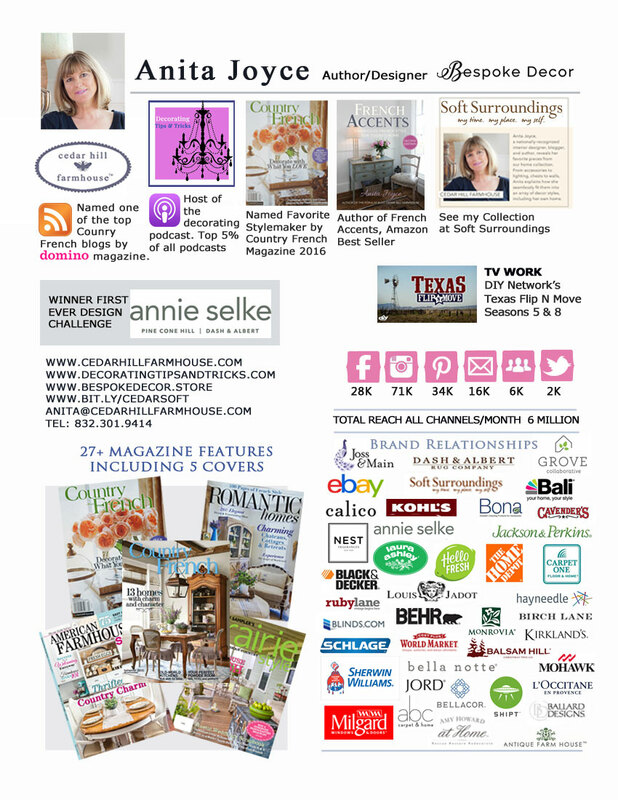 Love all of your pretty French chairs and ottoman…. Love the different looks each way. I too love the blue and white checked chairs. Thank you for these great ideas. I have an ottoman that I use as a coffee table and when pushed up to the couch it becomes a chaise..love the multi purpose uses. So many items can be repurposed into ottomans/benches. Thanks for sharing some great examples. I’ve gotten some great ottomans at thrift stores. Great to recover. I adore ottomans! I’m going to make one soon. I love all your ottomans. They are absolutely gorgeous. I love the big, fat round ottoman. Would make great extra seating for 4 people (or a card table with comfy floor cushions surrounding it). All look great . I love the piano bench one . Your slip covers are lovely. 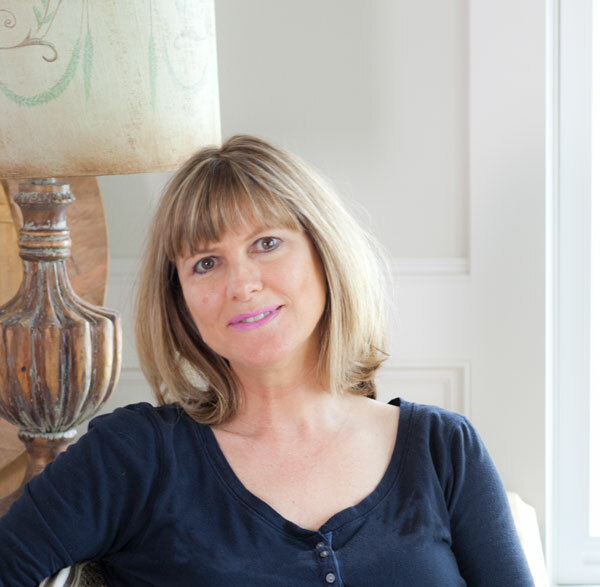 You have the most beautiful collection of ottomans (with an s) I love them all and a bit partial to the round one in your beautiful living room! I really like all of the ottomans. especially the round one. Thanks for sharing! I think the round one and the large one that perhaps started out as a piano bench are my favorites. I have none at this point, so lots to choose from. Your slipcovers are amazing!! 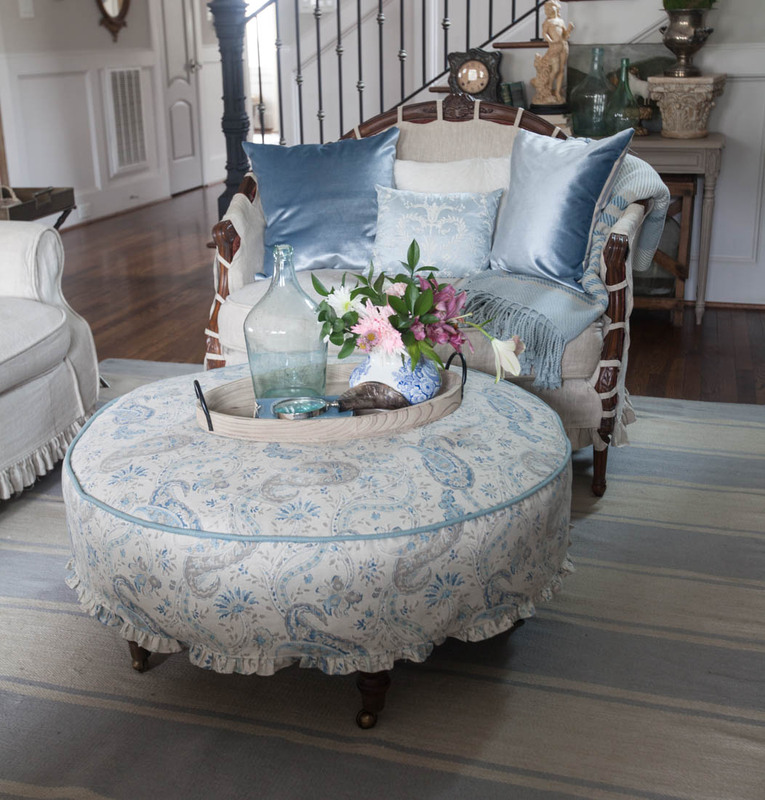 Love the round ottoman-thank you for all your lovely inspirations!! Buffalo checks. Love them. I also have a bench that works as an ottoman or coffee table. I love it too. I may need a couple of chairs and an ottoman slip covered- is that something that you do? 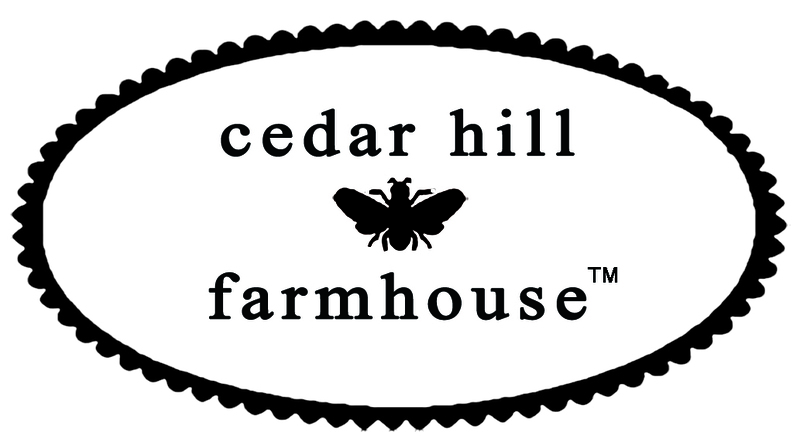 ?Or could you recommend someone in the Houston (Spring) area? Kris, try Neomy’s upholstery on Stuebner. They do great work. Your house is so pretty. Love the ottomans. Especially the blue buffalo check. Look forward to your blog everyday. 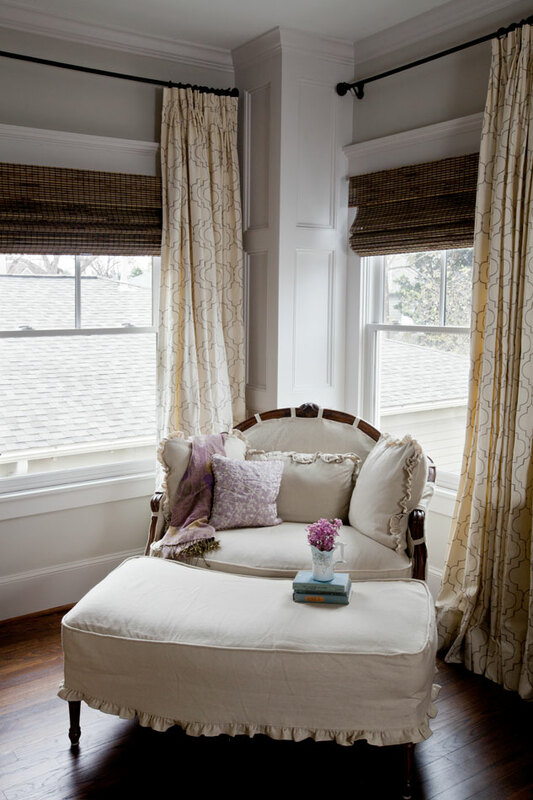 I love the cozy look of the settee and ottoman between the two windows, what a great place to put your feet up, relax and read a good book! Love them all, can’t make up my mind. I, too, have a “piano bench” and I’ve recovered it in drop cloth. I just love it even if it isn’t as pretty as the one pictured!! I have a thing for benches and ottomans anyway. Anita, every time I see your custom work, I’m impressed all over again. I just do not think I have the patience to attack something requiring that much attention to detail. I too especially like the blue buffalo chairs. Have a great weekend. 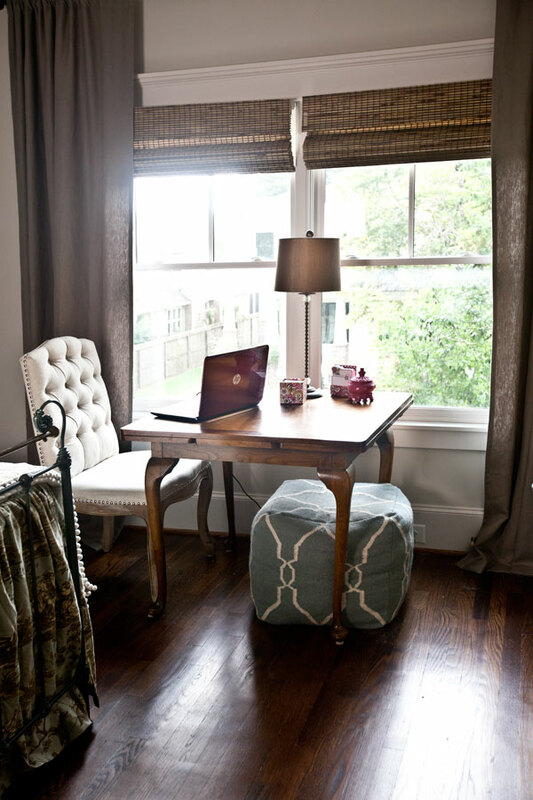 The simply designed Kilim pattern ottoman with the desk, chair by the window simply makes my heart sing. I love the way everything comes together with the use of the slip covers. The ottomans in your house are lovely but the blue and white check chairs are superb. My favorite is the burlap one. You are such a gifted seamstress, Anita – I love seeing the things you make. Love the buffalo check grouping. Looks like they belong together. Thank you Anita for the ideas! They were great as always! I’m in love with the blue and white buffalo check chairs! ? Thank you for the referral Anita. I can’t lie, I was kinda hoping you did slip covers and you would need to come out to our new house so we could show off our French limestone mantle from the Lorraine Valley, circa 1620. I love following your sites and know that you could appreciate the antiquity of the piece. Love the linen slip covers you made. You are sure talented. 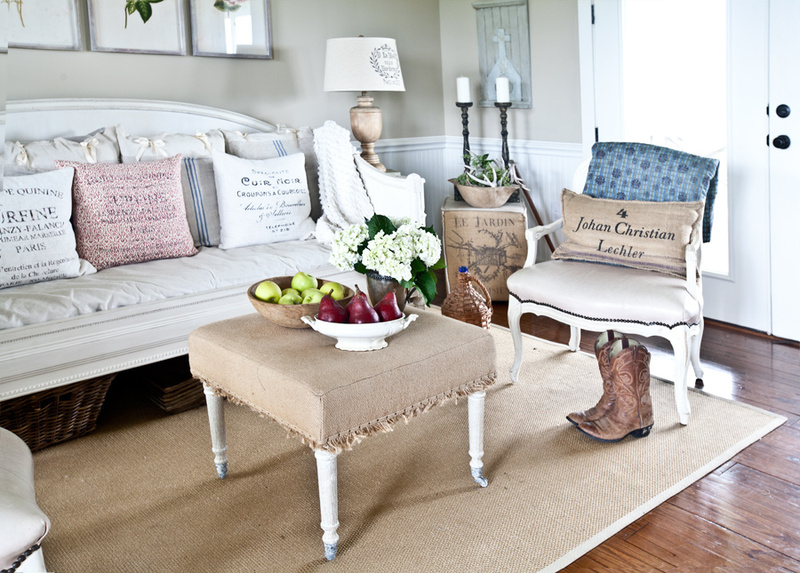 My favorite ottoman is in the farmhouse living room, cute and simple. So charming! I’ve never thought of a kilm working but will now! Thank you! Who doesn’t love ottomans? 🙂 I really love the big round one and of course the French bench/ottoman. Thanks for all of the inspiration! I LOVE your blog! I’m constantly sending your neat ideas to my friends? I love the round one. It just looks so comfy and homey (Is that a word?). 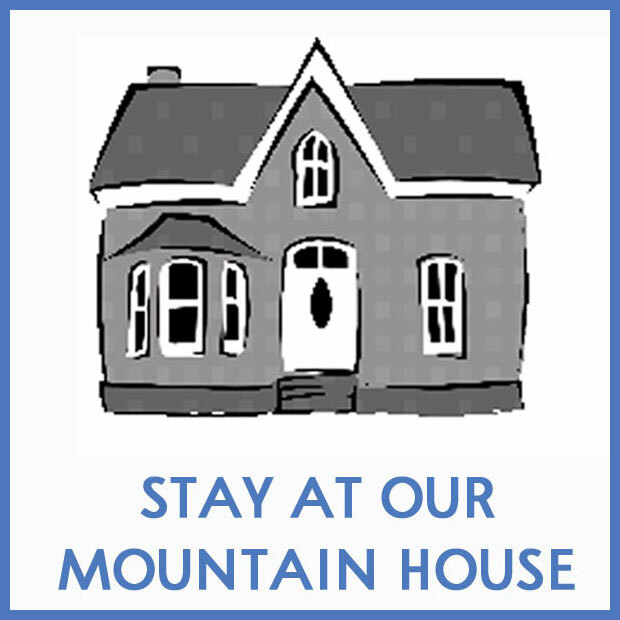 Your house represents such love and comfort – I love visiting. I am so glad I didn’t have to pick a favorite ottoman, because they are all beautiful. 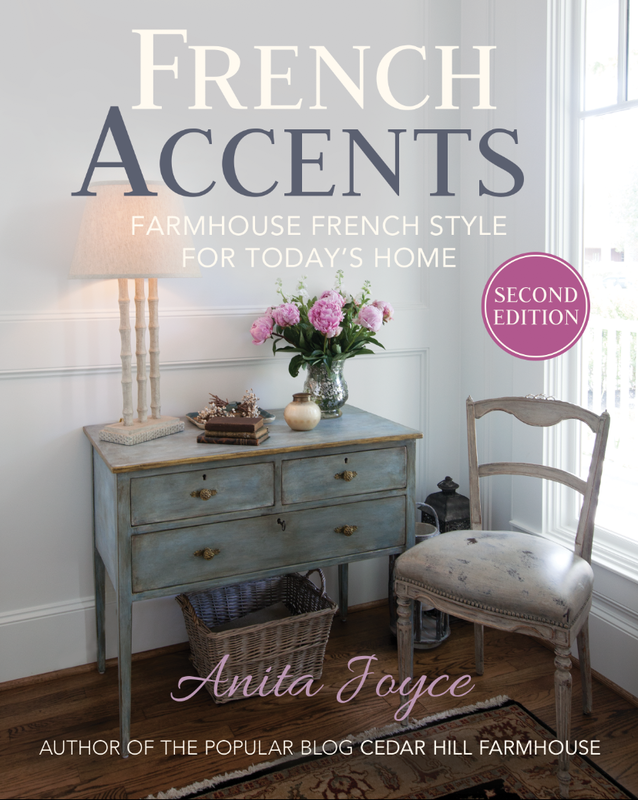 They compliment the “frenchness” in each setting. I always have had a passion for buffalo checks so therefore the blue chairs took my eye immediately! I love all of them. I could use at least four in my house. Thanks for sharing the showcase of beautiful ottomans. I love them all. Thanks for sharing how to create beautiful ottomans. Fantastic ideas! So practical and useful.